Sophie Skelton officially has more representation than ever; after all, she recently signed with ICM Partners in the United States. Related Outlander video – Take a look below for some more recent thoughts regarding the show’s future; also, subscribe to CarterMatt on YouTube for more and take a look at our show playlist. This news, first reported by Deadline, gives Skelton even more options for work; she continues to be represented by Industry Entertainment and Independent in the United Kingdom. So what does this actually mean when it comes to the future of Sophie in Outlander? Not all that much. Basically, this is a move that signifies their status as a rising star, as there could be more and more opportunities that come her way in the United States. It is fairly commonplace for many British actors to elevate their working status in America over time, as they look to seek additional work in big projects. Outlander is a show that does offer such an opportunity, almost as a springboard. Even though it does film for a substantial period of time, we have seen already that there are lengthy hiatuses in between seasons. This past one, for example, has lasted several months. We are starting to get to the end of it now, but there was certainly a pretty big break in between season 4 and season 5. Don’t look at this as any sign that Skelton is going to leave Outlander in the near future, or really that anything is changing when it comes to her status on the show as a whole. This is just the chance for her to get an even bigger piece of the entertainment pie. 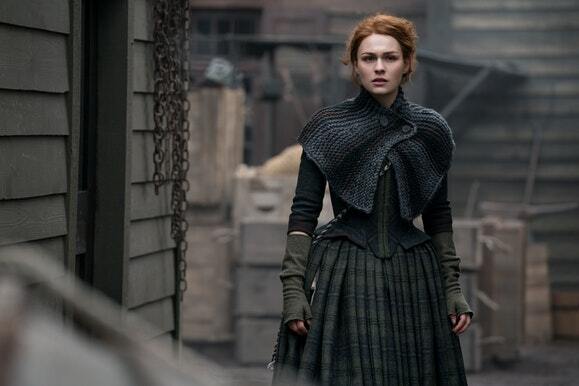 We certainly do think that there could be more movie roles coming for her in the future, just as we have seen Sam Heughan and Caitriona Balfe find plenty of their own during the hiatus. Sam, for example, just wrapped up work on a new movie entitled SAS: Red Notice. Sophie is coming off of her largest season of Outlander to date, as we finally got to see Brianna and Roger’s love story. There was certainly a good bit of sadness and hardship in it, though the two of them were able to eventually reunite in the finale. This does give us a little bit of hope for the future of the couple, but they haven’t really spent all that much time together. With that in mind, it is fair to assume that they have a few different things that they are going to have to work through. The hard part for us is just going to be waiting for the show to come back on the air. It may not happen until 2020.